Red Squirrels are active all winter in Alaska. As winter settles in on the forests of Alaska, wildlife quiets down. Most songbirds are gone, and mammals like bears, bats and marmots are hibernating. But red squirrels, the marmots’ tree-dwelling cousins, enliven the winter forest with their activity. These territorial, half-pound dynamos are active all winter long, guarding their food caches from marauding neighbors and scolding any interlopers. Red squirrels are found in forests throughout Alaska, as far north and west as Council, on the Seward Peninsula near Nome. Their range extends clear across Canada and down the Rocky Mountains, making them the most widespread tree squirrel in North America. Red squirrels are easy to identify - they are the only tree squirrel in Alaska that is active by day. Alaska’s only other tree squirrel, the secretive northern flying squirrel, is nocturnal. Alaska is home to one ground squirrel, the Arctic ground squirrel, and there are no chipmunks in Alaska. If a squirrel is scolding you, you are probably trespassing in his territory. Squirrels claim a half-acre to one-acre territory, and that comes with the exclusive right to harvest cones. Much of the squirrels’ diet is conifer seeds, and the squirrels’ survival throughout the winter depends on finding enough cones to harvest – and defending their food supplies from thieves. Squirrels compete fiercely for territories, and squirrels in poor habitat must travel farther afield to collect enough cones to survive the winter. These are generally juveniles that have been excluded from better feeding areas by established adults. On the move, they are more likely to be picked off by hawks, owls, martens and cats. Those that can’t find a territory by autumn usually don’t survive their first winter. But once a squirrel establishes a territory, it can live up to 10 years. Red squirrels are important prey for goshawks. Alaska Department of Fish and Game biologist Steve Lewis looked at goshawk prey in Southeast Alaska and found that after grouse, red squirrels were the second most common prey item in terms of numbers and biomass. In spruce bottoms where red squirrels are particularly abundant, such as the area between Herbert and Eagle rivers north of Juneau, red squirrels comprised of 75 percent of the goshawk’s diet. In summer, a red squirrel will clip thousands of green spruce cones. These are stashed in a midden, a central storage depot in the heart of its territory. The next time a red squirrel barks out its challenging “chuck-chuck-chuck” or bursts into a frenzy of chatter at your intrusion, look around. At the base of a large tree or under a windfall you’re likely to find a pile of shredded cones – a mound two or three feet deep and 20 or 30-feet across, riddled with holes and tunnels. Beneath those fluffy brown cone bracts and stems is a cache of green cones loaded with seeds, enough food to carry the squirrel through the long northern winter. Underneath this pile of spruce cone debris an Interior Alaska Red Squirrel has stashed a winter food supply. In years past, a commercial market existed for red squirrel pelts, and for a time trappers in the Yukon targeted these small furbearing mammals. 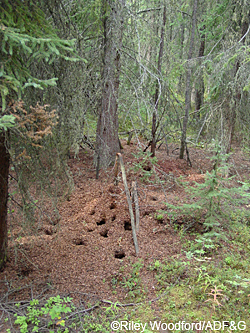 They found they could trap a number of squirrels at a single midden, leading some to believe that a colony of squirrels shared a midden. But the territorial red squirrels don’t share - the snared squirrels were likely neighbors quick to investigate an empty territory. In summer, it’s possible to come across the unlikely sight of fat white mushrooms tucked into tree braches. Red squirrels harvest mushrooms and carefully dry them before caching them in trees near the midden. Squirrels are rodents, and like most rodents, they’re omnivorous. But red squirrels tend to be even more omnivorous than other squirrels, and will eat baby birds and bird eggs, as well as insects, berries, green buds and lichens. Studies around Kluane Lake in the Yukon have shown they eat baby hares and mice. Les Palmer, an outdoor writer in Sterling, on the Kenai Peninsula, said in the springtime he’s seen squirrels chew their way into his birdhouses to get at baby swallows. In one case, Palmer said a female red squirrel cleaned out a nest box and then moved her own young into the birdhouse. Red squirrels will also take advantage of sap wells drilled by red-breasted sapsuckers, and have been seen chasing the birds away from their carefully drilled holes so they can lick the oozing sap themselves. During the winter, however, pickings are slim and squirrels rely on the supplies they’ve stashed in their middens. Red squirrels don’t nest in the midden, but in nearby trees. They build nests of grass in the forks of trees or in witches’ brooms, those massive clumps of twigs and sticks that can form in spruce trees. A squirrel may build several different nests, some for sleeping, some for sitting and feeding - and for guarding over its territory.